A suitcase and a Deli Doll? Today the girls and I spent the afternoon at my moms home. Today was no unpacking, no lifting boxes and no moving furniture day. If you recall she moved in August and we moved in September; it seems all our spare times goes to unpaking, lifting and rearranging furniture. 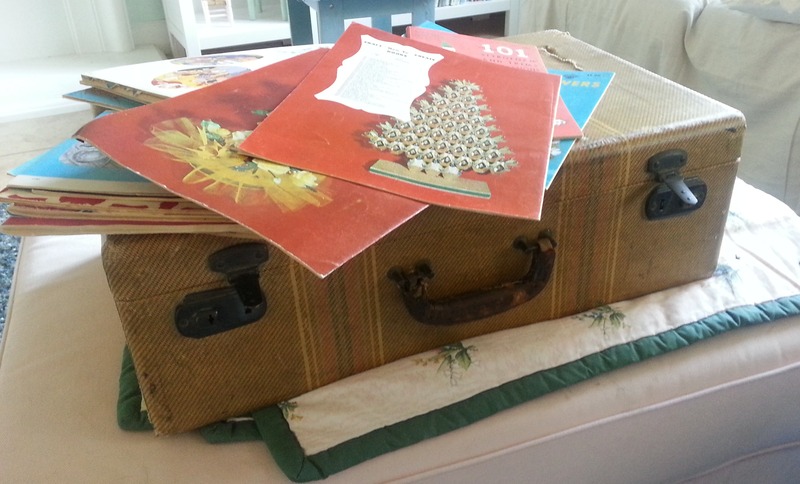 But today we sat on the sofa and looked at vintage magazines that my mom found in this suitcase. Relaxing and hysterical. Shall we start with a little holiday decor, for the exterior of your home? Christmas is right around the corner. “For nighttime hospitality, and to create a dramatic effect, here’s the ultimate in professionally ability. 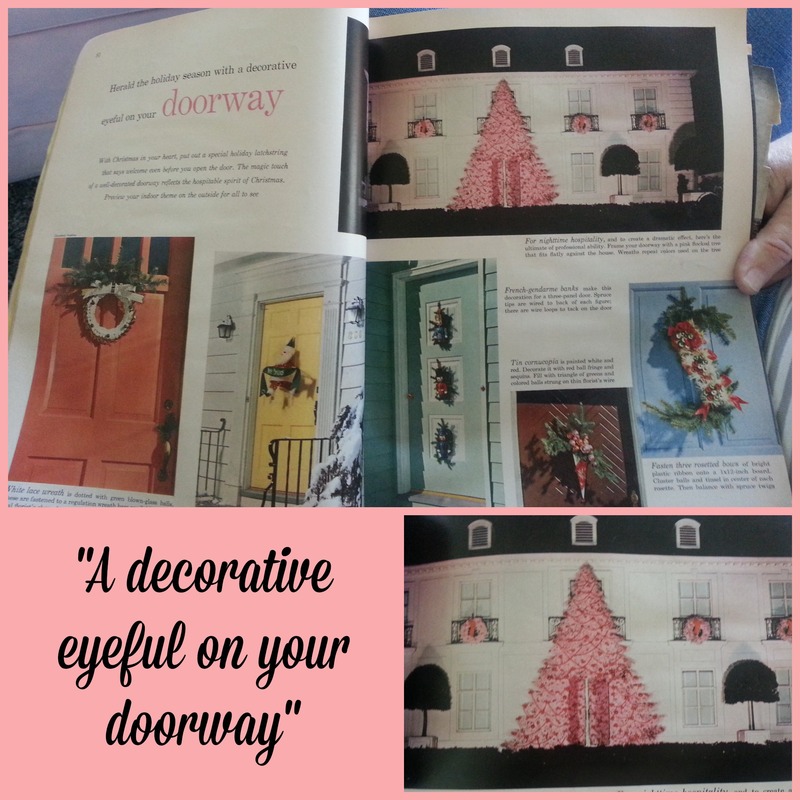 Frame your door way with a pink flocked tree that fits flatly against your house.” Okay can we just agree on how fabulous this is! And if anyone actually did this… kuddos! I would love to do this to our home. However, I am pretty sure Hubby would think I had gone over the deep end of crazy town. And where do you find a pink flocked tree that big. Obviously I would have to make it and I definitely do NOT have time for that. If anyone does this, you are my hero and I want pictures! How about some crafting? We all love a little of styrofoam crafts don’t we? This stelar little book has some nifty ideas; not sure which is my favorite. A few of these like the Santa’s and the chimney scene could have potential. Like on the so tacky it’s cool scale. Not even sure what the top left is supposed to be. We guessed an ornament of some sort, but not really sure. Now my favorite. The recipe books. Really it’s amazing. Truly amazing what people used to eat. Maybe some still do, but in my world WOW! Shall we start with a round of “Ring Around the Tuna” from the “Cooking with Jello” book circa 1960. “Ring Around the Tuna” would be a delightful salad for any dinner party. Salad? How is this salad? It contains lime jello, canned tuna (drained of course), pineapple, green stuffed olives and celery. Maybe the garnish of curly endive and radish roses make it salad? YUM! (okay really I can not even imagine what this tastes like). Next comes the Viking Ship Sauce Dish carved out of a cucumber… very creative. Honestly I might just be crazy enough to do this one day. I will share if I do. And can we just take a moment to look beyond the Viking ship cucumber and notice the tinsel garland on the table. Okay that looks pretty. Why didn’t I ever think of that? Then we have the desert spread. Lot’s of delicious looking cookies, popcorn balls and a lovely cake. We started reading what kind of cake this was, looks like some kind of lemon, raspberry cake…But wait! It’s not an actual cake on the dessert table- oh no. It’s a sandwich “cake!” My mom and I where in complete hysterics at this point. Sandwich cake? Yes of course. It’s a ham and egg sandwich made to look like cake. Plus it has cream cheese “frosting.” If I was at this party and chose to have what looked like a lemon raspberry cake and took a bite to discover it was a ham and egg sandwich– I would probably get sick. 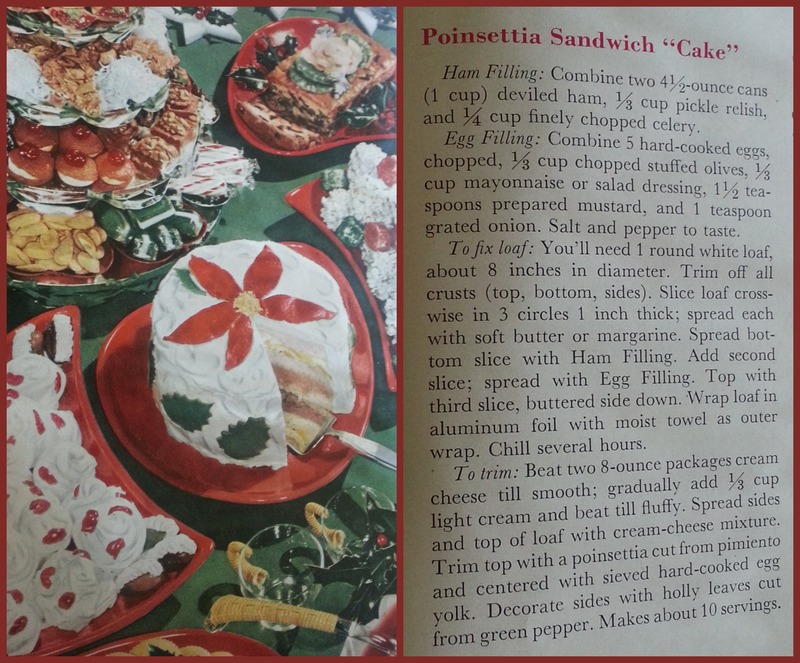 If you make this Poinsettia sandwich cake, please don’t put it on the dessert table. Right? And now the best thing ever. Yes I am being facetious. Very in fact. 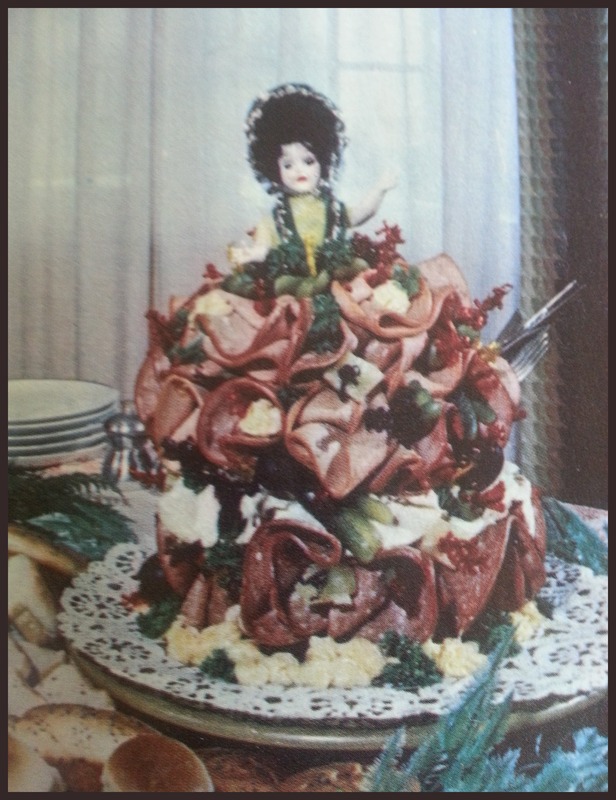 No party can be complete without the Deli Doll. Yes The Deli Doll!!! Yes this “conversation-sparker with her skirt of tempting cold cut meats” is…. I don’t even know what to say. The article says “The deli-doll is attractive featured by herself or on a tray surrounded by more cold cuts or breads” I… yes. I still don’t have the words. I thought I would share a few of my favorite books. These are the “go-to” books of the moment that are helping me get through preparing for a craft show. They sit by the sofa, on my bedside table and one was in the kitchen, not sure why exactly, but that’s where it has been. 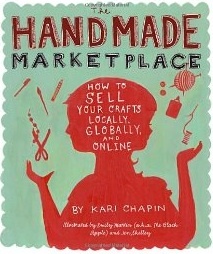 First up, The Handmade Marketplace, how to sell your crafts locally, globally and online by Kari Chapin. This book is small and paperback, which I like because if I wanted to, and I have, I can toss it in my handbag for those moments when I have a few spare minutes to read when out and about (HA HA HA who am I kidding, that hasn’t happened in three and a half years). There is a lot of information about branding, business basics, advertising and craft fairs, plus more. Kari set up a “Creative Collective,” people who have become very successful selling their arts and crafts, who give their input too. This should/needs to be in your collection. Up next, Craft Inc. by Meg Mateo Ilasco. Meg is one who started making wedding invitations in college and it became a full time business, which she recently sold to start a new business in housewares and gifts (how fun!). This book, also, covers the basics, my favorite chapter 7: Ups, Downs, and Next Steps, which I can dream about for now, hiring help because you have too many orders to cover yourself- that will be the day! She also has artists/business owners that talk about there mistakes, we all make them, which is comforting to read. 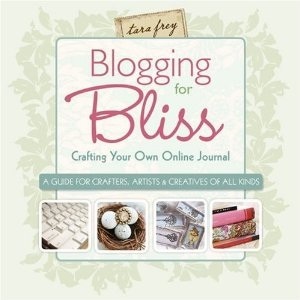 Blogging for Bliss, crafting your own online journal by Tara Frey, is a great read for blogging how to, tips etc., it lives under my laptop. Lots of nice photo how to’s here, I have read that section many times, to not much success, but that’s my user issue. This book is fun in that there are “Meet the blogger” pages through out where there is a bio (for lack of a better word) about popular bloggers, who have made it big blogging, they give there favorite blogs, tips, success and failure stories. If you are like me and start looking at the blogs mentioned, 4 hours later, it’s past midnight and you are not sure how that happened. 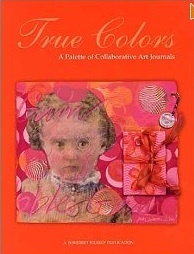 One book that is not related to business or craft shows, but is full of creative inspiration loveliness is True Colors A Palette of Collaborative Art Journals. This one is off the shelves because I enjoy seeing how creative people are. It makes me feel like being creative. Another reason I enjoy this book, it speaks to my need to organize by color, every chapter is based on colors. Me like! 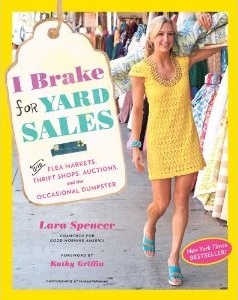 And lastly, a book I stumbled upon, I Brake for Yard Sales and Flea Markets, Thrift Shops, Auctions and the Occasional Dumpster by Lara Spencer. Fun! Fun! Fun! This book speaks to my heart, of late. Lara shows items she finds and how she has made them fantastic. Beautiful photos and fun tips; I want to go thrifting every time I peak at this book. If you are a thrifter you need to peak at this book! Have you read any of these? 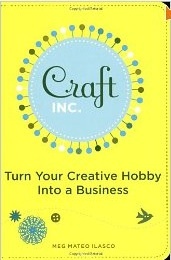 Do you have a favorite crafting business book that I haven’t read? I would love to know what they are. 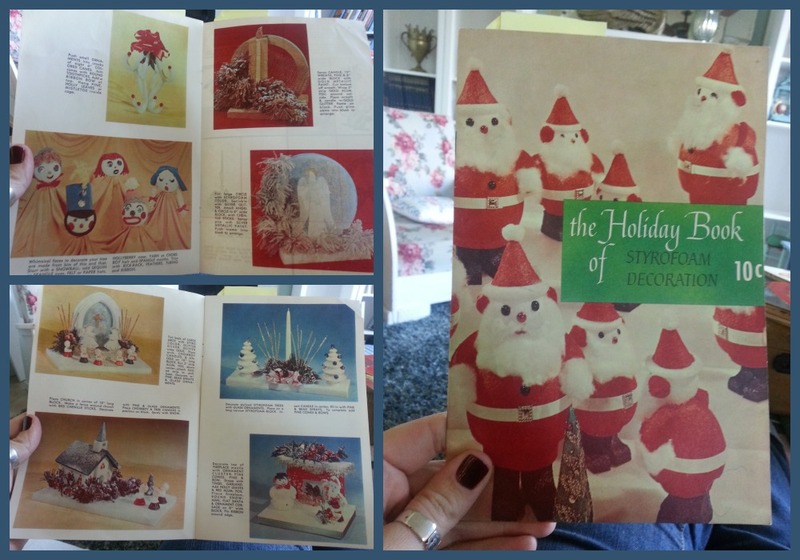 This entry is part of 31 days of preparing for my first craft show, click here to read more.